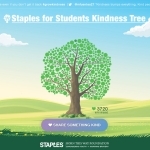 FRAMINGHAM, Mass.--(BUSINESS WIRE)--Staples, Inc. (NASDAQ: SPLS) teamed up with Lady Gaga’s Born This Way Foundation to create the Staples for Students Digital Kindness Tree that debuts today online at www.StaplesKindnessTree.com , to encourages people nationwide to promote kindness in schools and celebrate everyday acts of kindness. Kindness trees are often used in schools, on classroom or cafeteria walls, to spotlight and encourage acts of kindness. Staples and Born This Way Foundation are bringing the concept to life digitally. 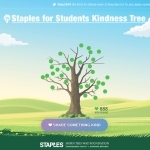 The Staples for Students Digital Kindness Tree builds on the company’s Staples for Students program, which partnered with Lady Gaga and her Born This Way Foundation to support education nationwide and promote positive classroom experiences. Consumers can help grow the Staples for Students Digital Kindness Tree at www.StaplesKindnessTree.com or by tweeting with hashtag #GrowKindness. On the website and Twitter, users will have the opportunity to describe an act of kindness that they recently performed, witnessed or pledge to do. Each time an act of kindness is reported, a “leaf” will be added to the tree, which will continue to grow throughout the summer with each kind act reported. “Born This Way Foundation is excited to be joining forces with Staples to channel kindness in our schools. We share a commitment to building environments with and for students, parents, and teachers that are positive, compassionate spaces. The Staples for Students Digital Kindness Tree takes those efforts online and allows everyone to help kindness grow,” said Cynthia Germanotta, president and co-founder, Born This Way Foundation. Staples is also a proud sponsor of the 2017 Lady Gaga Joanne tour promoted by Live Nation. 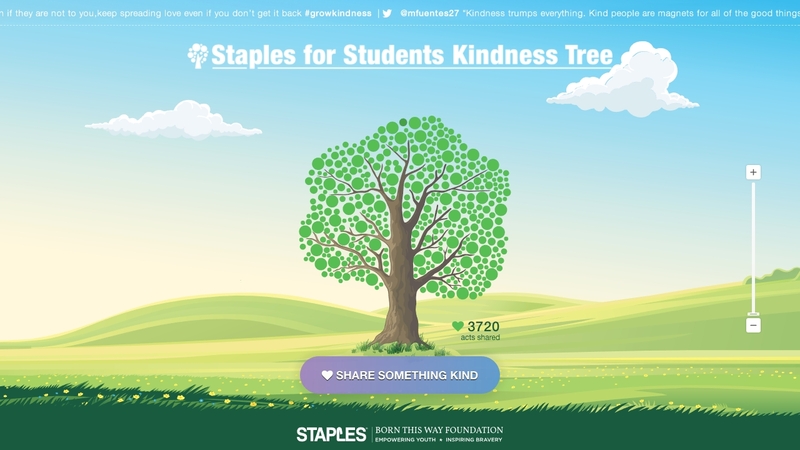 At tour stops in select cities, concert-goers can visit the Born This Way Foundation Kindness Pop Up to contribute to the Staples for Students Digital Kindness Tree via tablet or mobile device. Born This Way Foundation, which Lady Gaga co-founded with her mother, Cynthia Germanotta, supports the wellness of young people and empowers them to create a kinder and braver world. Staples has a long history of supporting students, teachers and classrooms. Staples for Students is an ongoing program that helps students and teachers with the school supplies and essential items needed to achieve success in education. The Staples for Students campaign has included school supply drives, support for teachers in classrooms, donations for education projects, and the sale of products that give back to communities and classrooms in need.